Appartementhaus Urstöger is a self-catering accommodation located in Gosau, directly at the ski slope, 100 metres from the Hornspitz Express I Cable Car, a ski school and a ski hire. A ski storage room and free WiFi are available on site. The two-storey chalet includes a terrace, 3 bedrooms, a fully equipped kitchen, a living room, and 2 bathrooms. It features satellite TV, and towels and linen are provided. Restaurants and a café are nearby, and hiking and cycling tracks are accessible directly from the Appartementhaus Urstöger. Hallstatt, its salt mine and the Dachstein Ice Caves are within a 20-minute drive, while Salzburg is a 60-minute drive away. 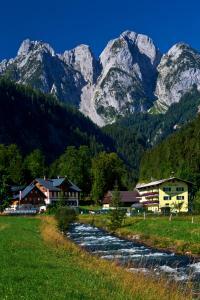 When would you like to stay at Appartementhaus Urstöger ? This two-storey chalet features a terrace, a balcony and satellite TV. The ground floor comes with a double room, a quadruple room and a bathroom, while the upper floor includes a fully equipped kitchen with a dishwasher and a seating area, a living room, a double room and a bathroom. This apartment comes with a bedroom with a double bed, a living room with a sofa bed, a large kitchen and a bathroom. In addition, it features a terrace. Payment before arrival via bank transfer is required. The property will contact you after you book to provide instructions. Please inform Appartementhaus Urstöger in advance of your expected arrival time. You can use the Special Requests box when booking, or contact the property directly with the contact details provided in your confirmation. Each day we'll check prices and send you an email for your selected dates at Appartementhaus Urstöger. If you don't have specific dates but would like to check prices for say next weekend or say next month we can check the price too. Click to write a review and share your experience of Appartementhaus Urstöger with other travellers.